The California Gold Regions not yet noted, indicating this is an early 1849 state of the map. 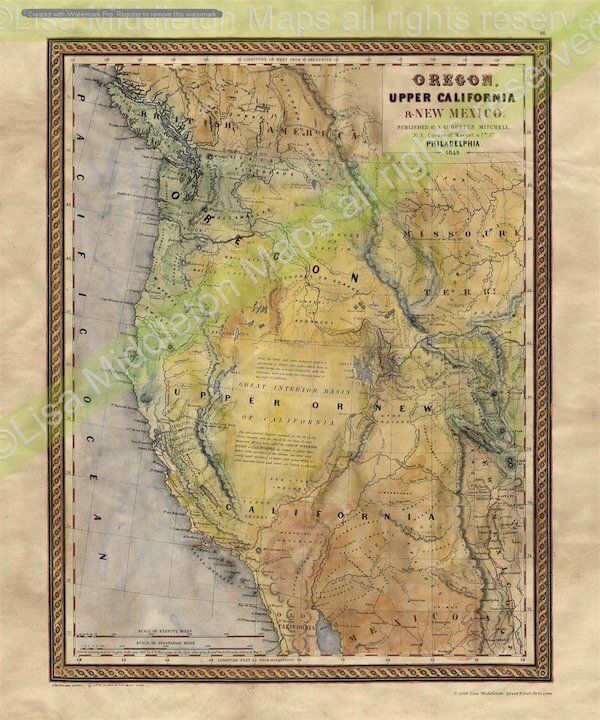 This dear map shows the Spanish Trail, Cooke’s Wagon Route, Kearney’s Route, Lewis & Clarke’s Canoe Route, Oregon Route, early roads, towns, Indian Tribes, mining claims, etc. An important early map, the first map of the West to appear in an American atlas after the Treaty of Guadalupe Hidalgo brought California into the Union. New Mexico is merely a narrow sliver of land along the Rio Grande. The Three Parks in Colorado (pre-Colorado Territory) are shown.